I'm officially 29 years old today. I'm tired today. Mainly because I stayed up until the wee hours of the morning to play Super Mario Galaxy 2 (an early birthday gift from MIL before she left for Ohio). It was a long day at work today, with a wonderfully pleasant surprise visit from my Grandparents, who decided to pop in and drop off a gift for me and give me a much needed hug. 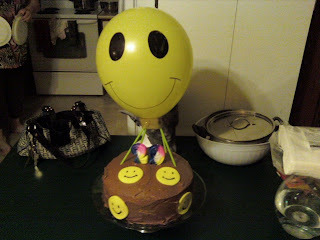 This past Saturday, we ventured over to a friends' house for dinner, where Mr surprised me with another party in my honor, which included some splendid decorations, a made-from-scratch cake (the awesomest ever! ), and the comfort of just being with people whom I knew appreciated me. It was a lovely weekend, tinted with a twinge of sadness, because I've made yet another mistake. My driver's license officially expires today. I've not the things I need to renew it quite yet, though I'm about three quarters there. This is due to me ignoring the issue, and from taking the two weeks off in the beginning of September catching up with me. So, I'm tired today, because I know this is my own doing, and I could quite possibly lose my job because of it. I'm holding my breath, waiting for the worst, but hoping for the best...because hope is honestly all I have left. So, I'm 29 today. I've gotten birthday wishes from nearly everyone I know, and I'm happy with that. I'm officially on my last year of being a twenty-something person, and this time next year will enter what I hope will be my more idealistic years. I hope to god that when my 30's do arrive that they are gentler on me than my 20's were. Oh, hell. I just missed your bday by about 2 minutes! I have a feeling that this last year of your 20s is going to be a good one!